The rotisserie is a roasting technique where the meat is rotated over a source of heat. This is usually done by skewering the meat along a spit (a long steel rod meant to hold the weight of the meat and traverse it without causing any damage), so it can turn evenly and cook from outside in. In most cases, a rotisserie roasting method is used on larger animals like chicken, pig, and turkey. Unlike flat grilling, a rotisserie is not prone to flare-ups, which can lead to a burnt meat with an undercooked interior. Food roasted through a rotisserie technique uses little fats with the excess ones gotten rid of through a drip tray. These trays are often removable for easy cleanup. Given that it makes healthy and delicious food, rotisseries are today on demand. They are numerous in the market, and this may be unhelpful to a consumer who may get confused on which product to pick. To simplify this for you, we unveil the following top 7 chicken rotisseries in 2017. 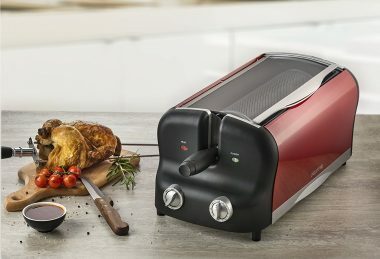 With the Cuisinart TOB-200 Rotisserie, you’ll not only have a dozen different ways to cook but also you’ll be able to rotisserie roast a 4-pound chicken. 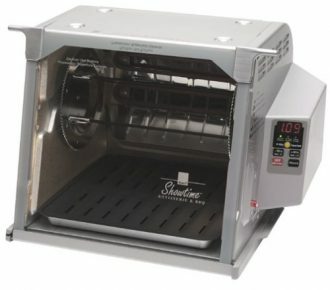 The unit uses 1875 watts of power, so it can heat quickly and cook precisely. Its stainless steel design will make your counter appealing. Moreover, the stainless steel material and nonstick interior surface make this unit easy to clean. The Cuisinart TOB-200 Rotisserie also features exact heat sensor that maintains precise oven temperature. 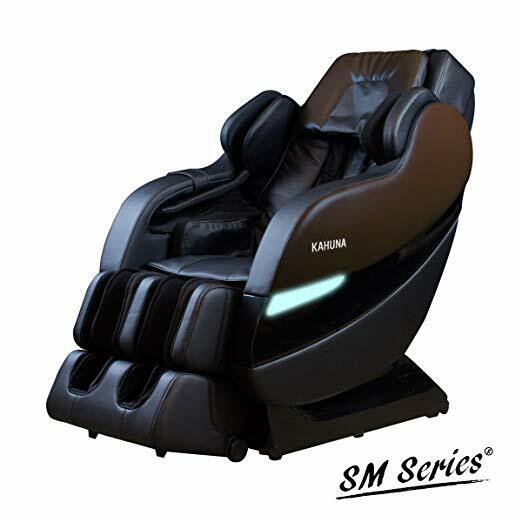 It is an innovative machine designed to please every creative cook at home. 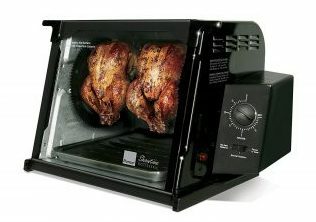 Let a simple chicken go from good to great within 1-1/2 hours with this showtime rotisserie from Ronco. 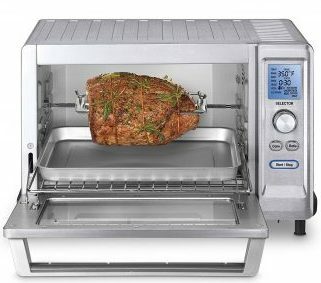 It boasts a rotating design and constant heat that allows you to roast beef, roast chicken, and even a rack of ribs without using the excess fat. Aside from making a delicious chicken and beef, this versatile rotisserie can help you make delicious entrees and appetizers. It has a Rotisserie basket, which is ideal for chicken pieces, hamburgers, vegetables, and more. It also features a 3-hour automatic timer, and this makes it an energy efficient unit. 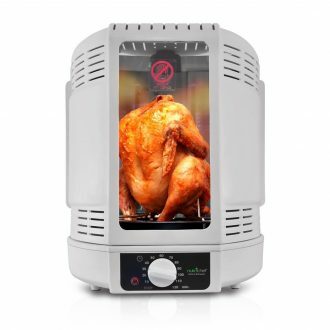 Chefs clearly understand that the greatest way to make a chicken delicious is through rotisserie, so why not use the Ronco ST5000 Model to achieve this? It is designed to start cooking immediately and quickly; thus, it uses 1/3 less energy than most conventional ovens. Besides, it is spacious enough to cook two chickens side by side. You can also cook a 15-pound turkey or nine quarter-pound hamburgers simultaneously. The ST5000 model features an elegant, easy-to-clean, non-stick surface and a removable dishwasher-safe glass door for ultimate convenience. The NutriChef PKRT15 Vertical Rotisserie will help rotisserie roast your favorite foods in a healthier, tastier way than other most roasting methods. It is a rotating oven that offers you the hassle-free food preparation with its advanced features and enhanced functionality. Insert your favorite meats in the included skewer tower or poultry rack and watch it turn into a mouth-watering delicacy. While the spinning-style design effectively cooks food, the dual heating elements ensure even distribution of heat. This unit is perfect for turkey, seafood, kabobs, steaks, beef, and chicken. 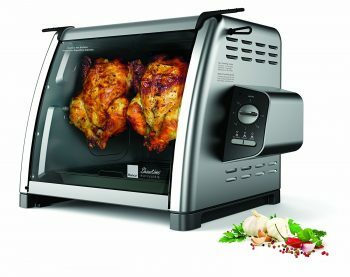 Make delicious chicken, appetizers, entrees, and even dessert with the Ronco ST5250 EZ Rotisserie. It has a specialized heating element and precision rotating speed that efficiently circulates heat to seal in the natural juice as well as evenly brown your favorite food while making sure the excess grease and fat drip away to included removable tray. The unit also has a push-button display that eliminates all the guesswork. 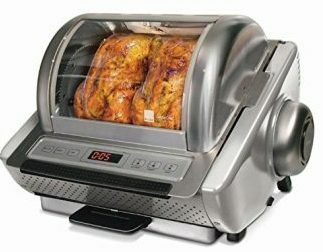 If you love the idea of a home rotisserie but you lack enough counter space, go for the ST5250 Rotisserie. For over 40 years, Ronco has been producing creative, innovative, and cutting-edge kitchen devices like the ST5500SSGEN Rotisserie. Made to please any creative cook, the Ronco ST5500SSGEN Rotisserie comes with everything you need to prepare a healthy and delicious meal. It has a removable drip tray that’s designed to collect excess grease and fat. It also features a multipurpose basket, carving platform, and spit. Ideally, its glass door eliminates guesswork by allowing you to monitor cooking progress, while the 3-hour automatic timer makes this unit energy efficient. This RotaOven Multifunction Rotisserie Grill will help you execute every diverse dish and impress your family and friends. It is a multipurpose unit that allows you to enjoy professional flavor and precision from the convenience and comfort of your very own kitchen counter. It features removable drip trays that are easy to clean for ultimate convenience. It also features an optional built-in 60-minute timer that makes cooking fun and simple. Prepare hearty pork roast, delicate fish fillets, delicious golden roasted chicken, lamb chops, shellfish, steaks, and much more with this innovative unit. Choose any of the above top performing chicken rotisseries for preparation of healthy and delicious meals. They are versatile and you’ll have the opportunity to roast such foods as chicken, pork, and more. Some can also be used to prepare entrees, hamburgers, and even dessert. The wide range of designs means you’ll get at least one that best suits your needs. So, elevate your roasting ability to that of a modern, creative, world-class chef with these unrivaled machines.